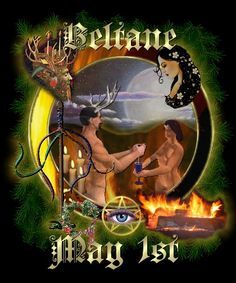 Beltaine eve and May-day are old Celtic tradition. During a Beltaine festival cattle were driven between two bonfires known as the Beltaine fires, to purify and protect them from disease of course this was before they were sacrificed so not sure how much protection was there. It was a prelude to the festivals the next day which was May-Day. Later it became a tradition to light a fire in the hearth, turn out all the lights and take a moment to give thanks to all our ancestors for the blessings we have. Not a bad tradition to continue today. For those of you who are into King Author, this is the day Morgan Le Fay seduced him bringing forth the child that would be his downfall and the end of Camelot. 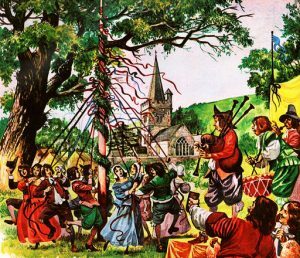 Mayday, the day after the Beltaine Fires, was a celebration of frivolity because Spring had sprung. People decorated their houses with flowers and ladies wore them in their hair. A May pole was erected symbolizing fertility, decorated with flowers and ribbons to represent the maiden goddess. People would dance around the May pole intertwining the ribbons creating a braided effect when done, representing the intertwining of life and the seasons. It is the time of year when warmer weather begins and flowers and trees start to blossom. It is said to be a time of love and romance. People would gather flowers along with other gifts such as sweets and candles and hang them on the door of friends as a warm gesture. It was also a way of letting a romantic prospect know that you were interested. Boys would hang the basket on the door, knock and run away. The lady could pursue if she choose and if she caught the gentleman, she could then steal a kiss. I remember making these baskets and leaving on the doors of elderly people in the neighborhood and the delight they had in knowing they were thought of. Perhaps we should revive this part of a wonderful tradition.